VOLUME, A COLLECTIVELY BUILT LIBRARY OF VINYL, ZINES AND PRINTS FROM THE COMMUNITIES INTERSECTING WOMEN ARTISTS AND TEXAS MUSIC. 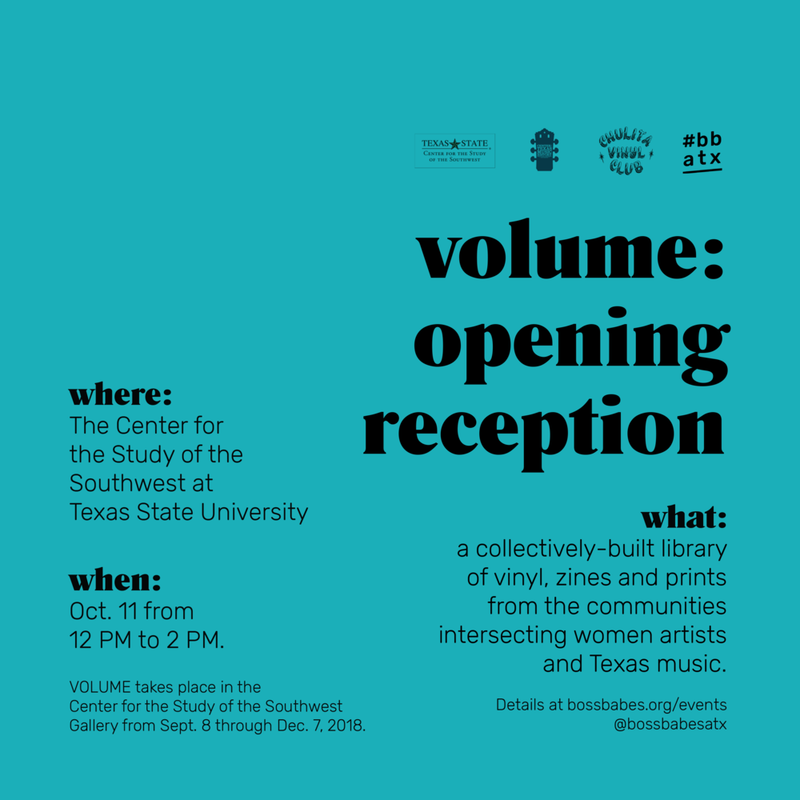 On Oct. 11, 2018, a collaborative installation between Chulita Vinyl Club and #bossbabesATX, “VOLUME,” will open at Texas State University in San Marcos, Texas. Join us from 12 PM to 2 PM for light refreshments and a first look at the body of work we’ll be collecting throughout Fall 2018. The Center for the Study of the Southwest (CSSW) and the Center for Texas Music History (CTMH) at Texas State University are pleased to announce Chulita Vinyl Club’s and #bossbabesATX’s upcoming exhibition, VOLUME. Originated as a way to contribute to the preservation of regional women's histories in Texas, VOLUME is a collectively-built library. Over the fall semester, we’ll gather vinyl, zines, books, and artist prints from the intersecting communities of women artists and Texas music. On the walls, you’ll find work by eight Texan visual artists, including Bodega Visual (Austin, TX), Jasmine Brooks (Austin, TX), Elizabeth Chiles (Austin, TX), Anne-Lise Emig (Austin, TX), Good Snake (Austin, TX), Katy Horan (Austin, TX), Ashley Elaine Thomas (Corpus Christi, TX), Whitney Noel Devin (Austin, TX). ― Gloria E. Anzaldúa,Excerpt from essay Geographies of Selves, 2015. Beyond collecting prints, zines and vinyl, this evolving collection will recognize the power of choice and the reward of reciprocity. 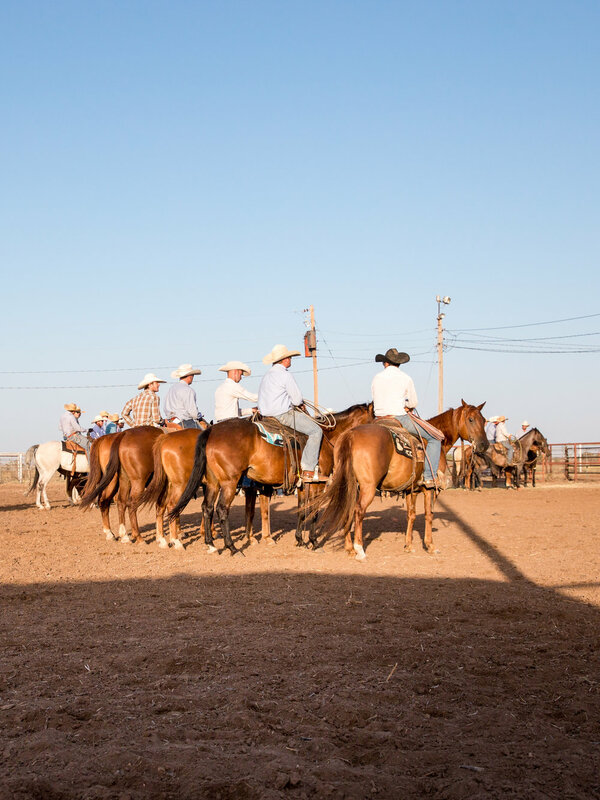 We are motivated by the possibility of coming to know ourselves, our many identities, and the worlds we occupy deep within the heart of Texas. Through this collection of materials, we encourage a new generation to become their own agents of cultural awareness. We hope to openly share the tools, tracts, sounds and visions accessed from our current and future ancestors with each other while building this library. “VOLUME” is free and open to the public within the Texas State University Brazos Hall’s gallery from September 8, 2018 to December 7, 2018. The opening reception for the installation’s prints will be held on October 11, 2018 from noon to 2 PM. Throughout Fall 2018, #bossbabesATX and Chulita Vinyl Club will accept donations of vinyl, zines and prints from the community to preserve history and the things that matter to us as artists. To contribute to VOLUME’s collection with your own donation, simply drop off items at any upcoming #bossbabesATX event between now and November 15. You can also schedule a drop-off by emailing hello@chulitavinylclub.com or send donations to 4810 Oak Cliff Dr. Austin, Texas 78721. Whitney Noel Devin. "Tulia, Texas." July, 2016. Elizabeth Chiles. "Night Palm", 2017. This mix comes directly from CVC San Antonio Elocuencia's collection. Come out and listen to Chulita Elocuencia (CVC San Antonio) spin tunes at our next event.